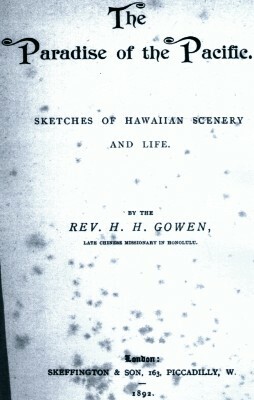 Rev H. H. Gowen : Waikiki, 1892. The Paradise of the Pacific - Sketches of Hawaiian Scenery and Life. Skeffington and Son, London, 1892. A very basic description of surf bathing at Waikiki by the Rev. Gowen, the "Late Chinese missionary in Honolulu." It is unclear what he meant by "tobogganing into the sea." Then towards the left again runs the sea beach of Waikiki as far as the headland of Leahi, shutting in the view on this side. Turning to the north you see a succession of valleys running up into the heart of the island. They are beautifully cultivated hereabouts, thanks to the Chinaman, and well watered. As we look at them they become almost hidden in driving rain-clouds, which will soon break,in heavy showers. It is a curious sight to see it raining fast in one valley, while the adjacent country is quite dry. .
"Our descent was a good deal more rapid than the ascent, and we soon exchanged the cool breezes of the mountain summit for the heat of the plain beneath." The city, as may be seen from this sketch, has no lack of picturesque surroundings, and even the tourist, passing through on his way to Australia, can, during the brief hours of the steamer's stay, get a very fair idea of the manifold beauties of Hawaiian scenery. In qne direction he can take the tramway to Waikiki, where he will find the summer residences, often grass houses, of many of the Honolulu people, placed here on account of the lovely sands and the cocoanut groves, said to be over 200 years old. There is always plenty of bathing here, with surf swimming and tobogganing into the sea, and when the blue waters are full of black heads, bobbing up and down, there can be no truer picture of the delights of tropical life. For myself, whether looking out to sea, or along the white coast, or back at the rainbow-spanned valleys, here has always been my realization of the ideal Pacific scenery. - Sketches of Hawaiian Scenery and Life. Geoff Cater (2013) : Rev. H. H. Gowen : Waikiki, 1892.